Home→Charts I'm Watching→Does the National Debt Matter? Nancy: American Express, this is Nancy. How may I help you? Me: Hi, Nancy, I’m calling to request an increase in my credit line. Nancy: Okay, I’m looking at your account, here… how much were you thinking about? Me: I’d like to double it. Nancy: Double? That’s quite a large increase. May I ask the reason? Me: Well, the thing is, I’m in kind of a bind. Nancy: I see. Some sort of emergency? Me: That’s exactly what it is. I don’t have enough money to pay my bills. Me: Well, if I could borrow more, I could pay my bills and still buy the stuff I need every month. Nancy: I see. And how would you pay off your American Express bill? Me: You guys don’t make me to pay it off every month. Nancy: Yes, but we do want you to be able to pay it off eventually. Me: Oh, sure. But, “eventually” is so far away, ya know? It’s like, in the future and everything. Nancy: How about your income… has it increased lately? Nancy: Maybe a reduction in your expenses…? Me: Nope. One in college, two on the way. And, they’re driving now. Seen gas prices lately? Nancy: How about investments? Any money coming in? Me: But, wait. Things are getting better! Nancy: Okay, great. Tell me about that. Me: Don’t you watch TV? The economy is improving. It’s all over the news. Nancy: Uh-huh. Okay, well your credit report shows your debt has increased quite a bit, lately. Me: Oh, yeah, everyone’s been really cool. I just got off the phone with Household Finance. Nancy: Don’t they charge a pretty high interest rate? Me: It’s insane! But, I’m getting a new big screen out of the deal. Nancy: You mean a TV? Nancy: I’m sure it is. Me: Did you know Katie Couric had really bad acne? Nancy: I happen to like Katie Couric. Me: Exactly! Everyone likes her. But, if they had a big screen like this… know what I mean? Nancy: Sir, if your debts keep rising, all your creditors could double your rates. Me: They can’t do that. Nancy: I’m afraid they can, and they probably will. Me: But… but, my payments would double. Me: How would I pay the rent, insurance, groceries…? Groceries are going through the roof. Nancy: That’s what I’ve been trying to say. Me: Ah, jeeze. What was I thinking? How could I be so stupid? Nancy: It’s okay, sir. It’s not too late to change course. We can help. Nancy: That’s what we’re here for. Me: Hello? Hello? Nancy, are you there? Hello…? Last night, at my 9-year old’s father-daughter dance, a friend mentioned that his investment manager (“really, really smart people”) insist that the spiraling national debt doesn’t matter. We’ve been down this road before, and it won’t matter this time either. Having spent 20 years in institutional investment management, I know all about his investment manager. I know that, like most managers, they’re better at marketing than managing money. My friend, who really, really is smart, will figure this out soon enough. But, it got me to thinking — have we really been down this road before? They point to the fact that debt soared during the Great Depression (40% of GDP) and World War II (95%), but those dollars were recirculated in the real economy — building dams, roads, planes and tanks — not gifted to banks to pad their balance sheets. Today, we sit at about 115% of GDP. 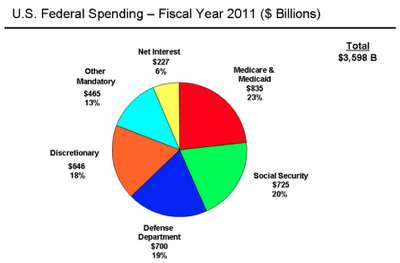 We spent about $3.6 trillion in 2011, while taking in only $2.3 trillion. That $1.3 trillion difference is paid for with more debt — now $15.5 trillion. Because interest rates are so low, we spent only $227 billion net in servicing the debt. You can pull that kind of thing off with a 10-year at 2%. If rates return to the 2000’s 6%, however, the annual interest burden would rival our annual expenses for Social Security, Medicare or Defense. At 1980’s rates, it would eclipse Social Security and Defense combined. These figures, by the way, assume we miraculously and immediately balance the budget — which would require a 66% increase in taxes or a 40% drop in expenditures. Don’t hold your breath. Bernanke and friends are doing the only thing they know how to do — they’re keeping their patient alive with an adrenaline drip. Congress and the White House are slipping him pizza and smokes when no one’s watching. And, the American public…we’re so engrossed in daytime TV in the hospital lounge that we can’t hear the heart monitor blaring. Does the national debt matter? Not at all. Until it does. "If there is a correlation"
I don't think there's much doubt. Nice graph. Great post Peb, Nancy is a true hero. the velocity of money is really slow right now, and almost ALL the money is in digital form, and the sheep are too dumb to recognise that their cash in hand has just lost 75% of its paper value since 2008. When the Sheep catch on to that issue..then the real inflation will kick in. I'm not sure where it was that I first came across this link (maybe ZH) but it is a little scary. I read you post first thing this morning and then later wondered if Tom Edison relied on federal grants to do his thing (my mind is a little weird). I came across this site and thought I'd share it. I was shocked the day I learned that consumption was the bulk of our GDP. How could that ever be something we could be proud of ? Is buying GOLD the answer? I remember just a few years ago, I would tell people.. 'hey, you know the US debt will be 20 trillion by 2015'. Ohh how they'd tell me I was crazy, it'd 'NEVER' reach such a high number. Well, $20 trn will be hit soon enough. The only question I have is when will the charade end? 25 trn? 50trn? 100trn? Yes, the Fed can print, exponentially more to fund ALL the spending, but…if it does, the currency will hyper-inflate away until the US really does have a case of the Zimbabwes'.